Steel toe and composite toe Ambles and Grafters footwear. Explore from a range of sizes and designs from Amblers safety boots a leading footwear manufacturer. Amblers Safety boots is a UK company with quality boots that give all day protection and comfort. Adventure1 had been dealing with Amblers for over 25 years and have found the quality of the footwear second to none. Using the latest manufacturing process they offer great quality footwear.with over 31 years of expertise they know a thing or 2 about footwear and especially safety footwear. Amblers Safety Boots have been around for a long time from around 1981 and are going strong. With an product range that is growing week by week with riggers, shoes, military safety and waterproof safety boots. It has become clear that there is no better supplier and we continue to grow our business with them. In the 80s, the management saw a need for good quality and comfortable brand of safety footwear at cost effective prices. AMBLERS are built on years of experience and high standards or workmanship and a reputation of supplying reliable footwear to the industry. Amblers Safety Boots became of age. They now distribute to the agricultural, construction and service industries. Prior to 1977, or occupational health and safety legislation was a bit thin on the ground and was not really working for the benefit of workers. This resulted in confusing law that no one understood.To address the problems a Committee under Lord Rubens was set up in 1970. The Robens report came out in 1972 with many improvements in the safety at work laws . Amblers were not slow to make the safety boots conform to the new regulations. The development of metal free composite footwear to the heavy duty range made it necessary for Amblers to change their name for Amblers steel to Amblers safety. With the development of modern composite materials.Many new designs of boots came into being with reduced weight and airport friendly designs and the composite toes did not set of metal detectors.Composite toes are made with material from non-ferrous tough carbon or plastic. Amblers Safety boots can offer a wide range of products including safety shoes, waterproof safety boots and trainers all at a fair price. Clean Amblers Safety boots, with a wet, not too wet, cloth or sponge with a mild detergent. Good cleaning protects the boots or shoes from premature damage. Clean with a damp cloth or brush before applying polishing with cream polish or wax. Nubuck should be cleaned using a brush and some Nubuck cleaner. Clean mud of the soles to retain grip. Allow to dry in cool area and not in hot places. Check for damage and make sure the toe cap is in place. Keep footwear ventilated when not in use.Use wax or coating for water resistance. If you are going to be near flames then we offer a heat resistant sole to at least 300°C. If you work in conditions where there are nails or spikes on the ground then a mid-sole protection boot is needed. These have a spike resistance of 1100 Newtons.Categories S3 ,S5 have a nail resistant sole. Look out for safety mid-sole. Rating of SB-E and S1 and above have absorption of 20 joules. Many accidents come from slips. Slippery surfaces can be a real danger. Amblers Safety boots have been put through their paces with slip testing on different surfaces. SRA tested on a ceramic wet tile with a solution of diluted soap and passed. SRB tested smooth steel on which a dilute soap solution has been applied contaminated with a dilute soap solution. The SRC tested on both SRA and SRB surfaces. This is the highest rating. Water-repellent boots SB-WR, S1-WR, S2, S3, S4 or S5. can be wipe clean with a damp cloth. SB-E, or S1 and above rating can be helpful . Allow some room in the footwear to allow the use of a foot-bed or thick socks. Look out for boots with for padded collars and check for high pressure points. These are for indoor and outdoor areas with different work surfaces. These would be with toe protection but a lighter boots or more casual style. Both men and women should wear. 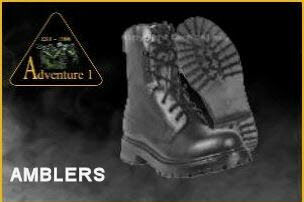 Amblers safety boots and shoes for the job and designed to protect feet. Footwear needs to be for the the working conditions you are in.Remember footwear guides for industries in a a guide only. Buyers should get information from the employer which type of footwear is needed. An employer has a duty to provide a safe working environment and in some cases provide free safety footwear. we recommend w/p rating which is boots lined with a waterproof sock or liner.This stops water for entering into the boots. If you work outdoors or in the wet then we suggest this rating. if you are only occasionally in the wet then you maybe happier with a WR rating which is water resistant. If you are going to be near flames then we offer a heat resistant sole to at least 300°C..